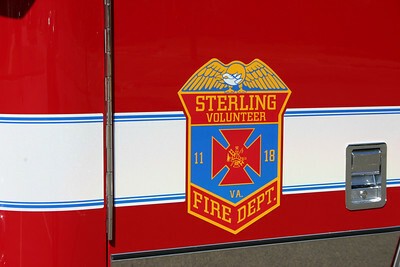 Sterling Volunteer Fire Department operates three stations - Fire Stations 11, 18, and 24. 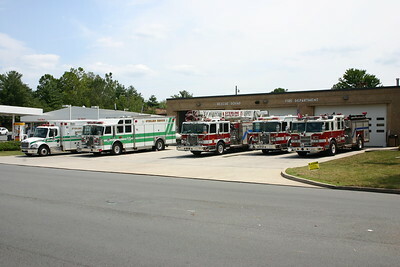 The following photos are Station 11 apparatus. 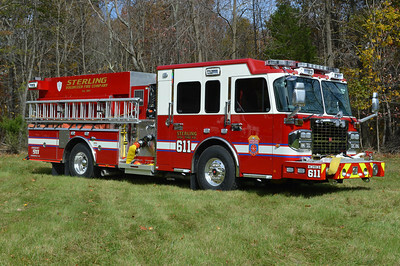 Engine 611 as photographed in October of 2014 just prior to being delivered to Sterling Fire. It is a 2014 Spartan Gladiator/Smeal equipped with a 1500/750/20 and assigned Smeal s.o. number 4299. Sterling ordered two identical engines for Engine 611 and Engine 624. The officer side of Engine 611, a 2014 Spartan Gladiator/Smeal 1500/750/20. 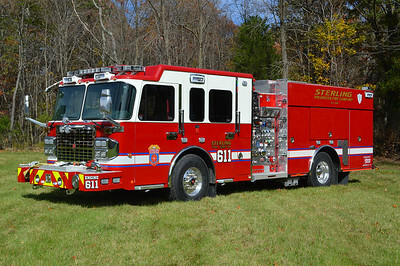 A rear view of Engine 611, a 2014 Spartan Gladiator/Smeal 1500/750/20. Engine 624 received an identical engine. 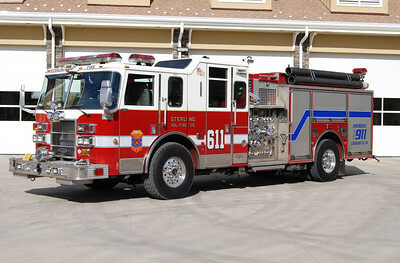 Engine 611B from Stering is a 2004 Pierce Lance equipped with a 1500/750. It was purchased at the same time as Sterling's Engine 624. This photograph was taken in November of 2013 at the Kincora Safety Center which is the home to Sterling Fire Station 24 and Sterling Rescue Station 35. While photographing the new Kincora apparatus, Engine 611 stopped by. I could not pass up the opportunity. 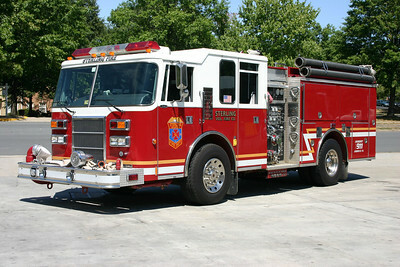 Tower 611, a large 2006 Seagrave Marauder II 104' tower. This photograph was taken at the rear parking lot of Fire Station 18 after just being placed into service. It replaced a 1991 Simon-Duplex/LTI 100' tower which was sold to Harrisonburg, Virginia. 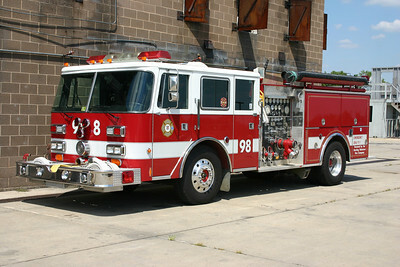 This unique 2006 Freightliner Utilimaster was built by Emergency Service Vehicles and operates as Canteen 611. 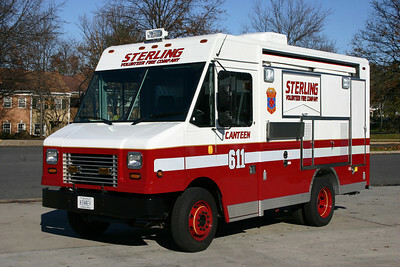 SERV 611 is Sterling's multi-purpose truck. In addition to providing "SERV" duties, it has been equipped with a brush skid package to help fight outside and smaller fires. 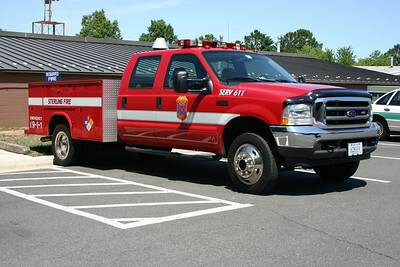 The 2002 Ford F450 with a Knapheide body originally entered service as SERV 18 in Cascades. 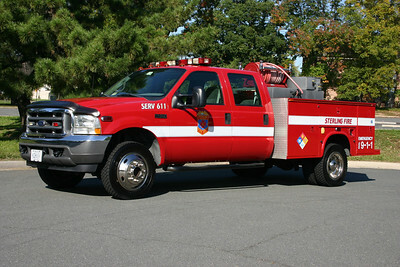 When the department purchased a newer 2005 Ford F550/Knapheide, this Ford was re-assigned to Station 11 as SERV 611. 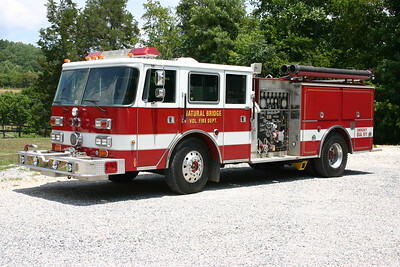 In 2008, a brush skid package was purchased from Vigilant Brush Equipment in New York and SERV 611 is equipped with a 400 gpm pump, carries 250 gallons of water, and 10 gallons of foam. This truck eluded me for quite some time before I was finally able to photograph it in October of 2011 near Fire Station 11. 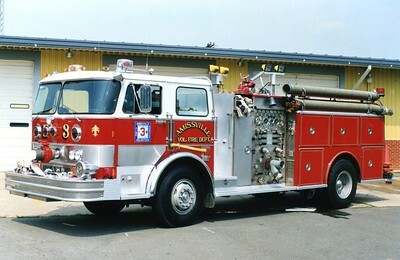 This is SERV 611 prior to the brush skid package that was added. SERV 611 (Special Emergency Response Vehicle) is a 2002 Ford F550 with a Knapheide body. It originally ran as SERV 618 before becoming SERV 611. Eventually, in 2008, this truck had a brush package added for additional versatility. Sterling, Virginia - Safety 611, a 2008 Chevrolet Suburban/FastLane. Ex- Command 618. 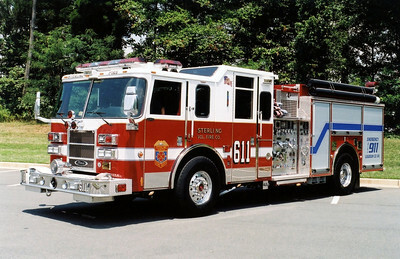 Former Engine 611 is a 2004 Pierce Lance 1500/750. One of the first engines in Loudoun County to be delivered and marked in the COG (Council of Government) numbering system of "611". 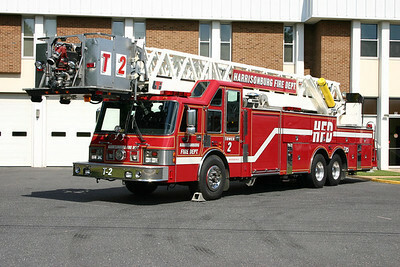 "6" represents the unit as a Loudoun County unit and "11" shows it is from Sterling Fire Station 11. 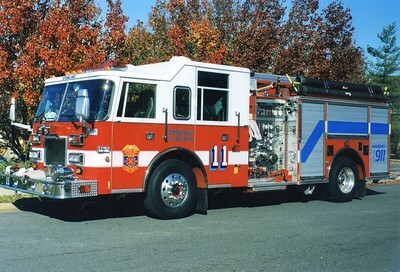 This Pierce engine was also delivered with another 2004 Pierce Lance, this one with a larger water tank of 1250 gallons and assigned to Sterling's Fire Station 18. Old Wagon 11, which received a nice refurbishment in 2013 by Keplinger Repair in Winchester, Virginia. Now privately owned, this 1985 Pierce Arrow was originally Wagon 11 in Sterling. In 1989, Pierce added the four door cab. 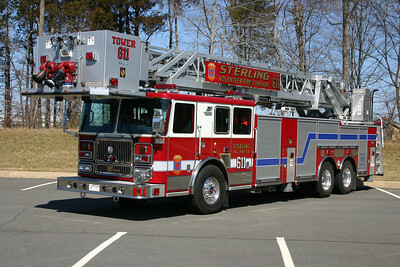 After service in Sterling, it went to the Training Center where it was Engine 98. Ultimately, it was sold to Keplinger Repair who used the Pierce as a loaner engine. 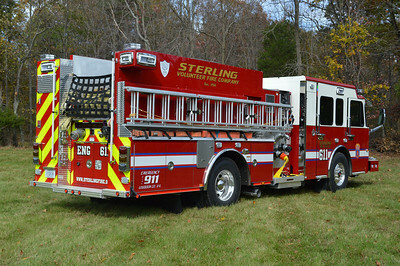 Keplinger Repair has a good relationship with Sterling Fire and the owner refurbished the Pierce to look as close as possible when delivered to Sterling in 1985. As a side note, this Pierce is currently for sale. Photographed in November of 2013 at Keplinger Repair in Winchester, Virginia. Former Wagon 11, a 1985 Pierce Arrow, 1500/750. 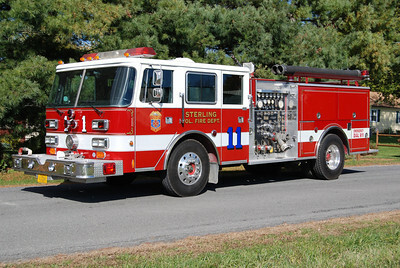 Sterling Fire's second donation to the Training Center became Engine 98. It is a 1985 Pierce Arrow that was rehabbed by Pierce in 1989 to include a four door cab. It is equipped with a 1500/750. 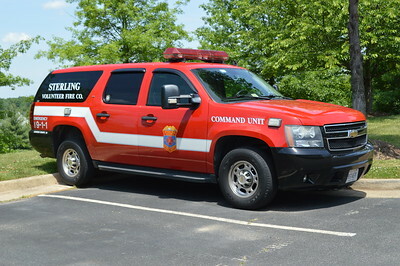 This engine is now privately owned in the Winchester, Virginia area and has been used as a loaner engine to several departments. 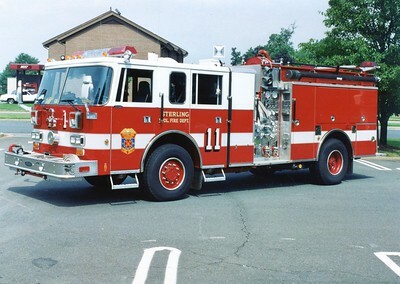 Sterling's former Wagon 11, a 1997 Pierce Arrow, 1250/750. Glider kit used from their unique 1991 Pierce Javelin. Sn - E5947 and F3780. A unique truck once ran as Wagon 11. A 1991 Pierce Javelin, 1250/500. 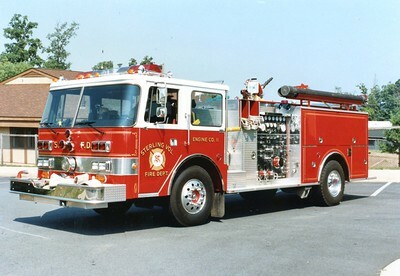 Another similar 1984 Pierce Arrow operated as Engine 11, equipped with a 1500/750. 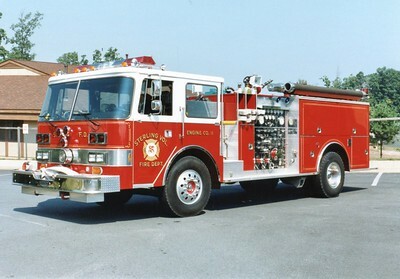 Former Engine 3, a nice 1977 Hahn, 1500/750. ex - Sterling, Virginia (Loudoun County). Sold to a dealer in Alabama in 2002. 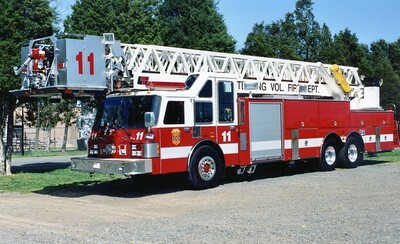 Former Tower 11, a 1991 Simon Duplex/LTI, 100'. Sold to Harrisonburg, Virginia, in 2006. 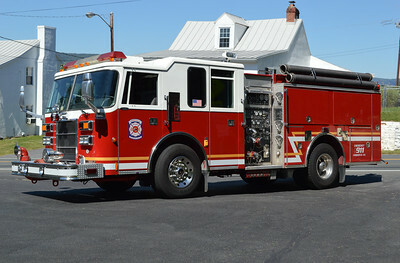 Sterling's old Tower 11 is now a reserve aerial truck in Harrisonburg, Virginia. It is a large 1991 Simon-Duplex/LTI 100' tower. It was sold to Harrisonburg in 2006. Note how the ladder beds on the cab between the raised roof areas.